Use PureBlu DAPI Dye for routine nuclear staining in flow cytometry, cell imaging applications and fluorescence microscopy. PureBlu DAPI Dye is available as a ready-to-reconstitute, highly pure powder form, with only one dilution step required to obtain a ready-to-use solution. DAPI (4',6-diamidino-2-phenylindole) is a well-characterized blue-emitting fluorescent compound widely used for nuclear staining. DAPI is a DNA minor groove binding compound which can permeate cell membranes therefore preferentially stains nuclei (Figure 1). Figure 1. DAPI (in blue) binding dsDNA. The excitation and emission wavelength of PureBlu DAPI Dye when bound to double stranded DNA are shown in Fig 2. 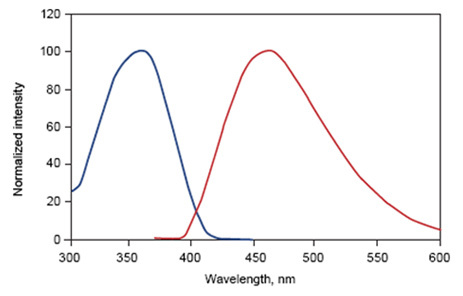 The Stokes shift between excitation and emission wavelengths is large which makes DAPI an excellent choice for nuclear counterstaining in Immunofluorescence Microscopy, especially when spectral separation is required to reduce fluorescence overlap. As an alternative to DAPI we also have Hoechst 33342 in a similar ready to reconstitute format suitable for unfixed samples. To determine cell viability we also offer the non membrane permeable DNA-binding cell staining dyes 7-AAD and propidium iodide, in ready-to-use formulations and fixable VivaFix™ Cell Viability Assays in a range of excitation and emission spectra to enable easy incorporation into multi-color Flow Cytometry panels.